How To Identify Smartphone Crawl Errors With Webmaster Tools? Mobile devices are fast becoming the norm these days, and the need for a mobile-optimized version of any desktop website has finally been widely recognized. But in the wake of it all, you can still observe some 'smartphone-optimized' websites that are misconfigured in such a way that it often becomes hard for searches to find the information that they're looking for. This is usually caused by 404 errors, or irrelevant redirections that might be useful for desktop users, but not so much for mobile devices. This results in an overall bad user experience for your website. But now, thankfully in Google Webmaster Tools, you can use the expanded Crawl Errors feature to help identify pages on your sites that show these types of problems. A lot of these problems are detected by Googlebot as crawl errors, which significantly hurt your website's user experience. This inspired a lot of the recently-announced ranking changes for smartphone search results, which means that now there's a proper algorithm in place for penalizing mobile pages with a poor user experience. 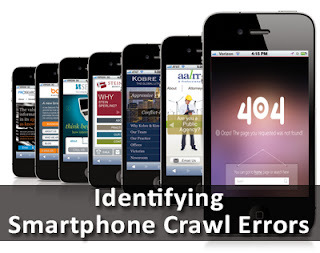 Which brings us to today's topic - identifying smartphone crawl errors to avoid search penalty. Starting today, you can use the expanded Crawl Errors feature in Webmaster Tools to help identify pages on your sites that show these types of problems. Google is introducing a new Smartphone errors tab where you can find pages identified with errors only found with Googlebot for smartphones. 404 Not Found errors: A page can show a "not found" message to Googlebot, either by returning an HTTP 404 status code or when the page is detected as a soft error page. Fixing any issues shown in Webmaster Tools can make your site better for users and help Google algorithms better index your content. You can learn more about how to build smartphone websites and how to fix common errors. As always, if you have any questions, feel free to leave them in the comments section below. nice and useful feature qasim. thanks for sharing it. it will really helpful..
kindly write how to solve data structure error in webmaster tools. I have these errors in the webmaster tools but my website is a pure desktop website not a mobile site or optimized for the mobiles then why do these errors are arising??? how about if you share a post about your older and newer post style at below your post ? please ?